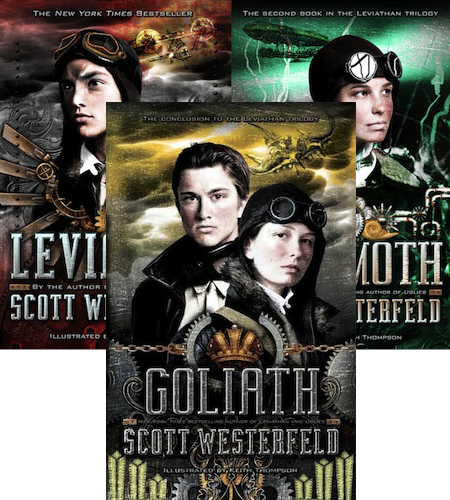 Scott Westerfeld has written a lot of juvenile fiction, but his best, in my opinion is the steampunk Leviathan Trilogy: Leviathan, Behemoth, and Goliath. In case you’ve never heard of steampunk I’ll tell you a bit about it. Steampunk is essentially Victorian inspired science fiction, generally occurring either during the reign of Britain’s Queen Victoria (1837-1901) or during a later time period that still has Victorian sensibilities and uses the technology of the time period (steam and mechanical as opposed to gas and computers). From there you will find a myriad of variations like dieselpunk. Jules Verne’s 20,000 Leagues Under the Sea would be steampunk if it had been written these days instead of in 1869. “Prince Aleksander, would-be heir to the Austro-Hungarian throne, is on the run. His own people have turned on him. His title is worthless. All he has is a battletorn war machine and a loyal crew of men. Watch the trailer for Leviathan here. This entry was posted in summer reading and tagged juvenile literature, novels, scott westerfeld, steampunk. Bookmark the permalink.